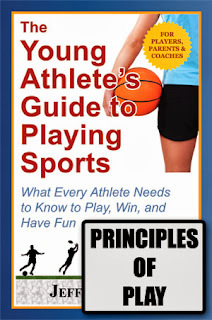 Here's another excerpt from my new book, The Young Athlete's Guide to Playing Sports. This topic is from chapter 4, Principles of Play. It discusses advantage/disadvantage situations that a player encounters during games along with related tactics. Most patterns of play in sports involve two opponents (individual or team) that initially have no advantage. But inevitably, of course, one side gains an advantage and the other is placed at a disadvantage. Sometimes this results from individual match-ups in which one player or team begins to physically dominate the other. At other times, an advantage is gained by executing certain tactics (offensive play, defensive scheme, etc.). Throughout this book we touch on ways in which you can both take advantage of and counter physical mismatches. Let’s now look at advantage/disadvantage situations from the perspective of tactics. Besides understanding the general patterns of play that will gain you or your team an advantage, you also need to learn the tactics to use when you are at a disadvantage. You need to know both how to defend your weakened tactical position and, ideally, how to regain a position of either neutrality or advantage. During the course of play, teams and players are constantly jockeying positions, each trying to gain the high ground—the position in which they have the best chance to dominate the opposition. A “big man” in basketball tries to post-up his defender on the block. A tennis doubles team wants to be at the net. Hockey and soccer teams try to play in their opponents “end.” A defensive end in football, tries to get the “edge” when speed rushing. And of course, each opponent in the above examples is trying to prevent the other side from gaining a dominant position. Consider a baseline rally between two tennis players (see diagram). At the outset, each player is located in the middle of the court. Neither has an advantage over the other. But as the rally continues, one player (X2) starts to control the play, hitting return shots at sharper angles, moving the other player (X1) farther to one side of the court. Through the use of a well-executed sequence of shots, advantage has swung toward X2. On the defensive, and out of position, X1 knows that X2 will eventually try to hit a winner to the opposite side of the court. X1 needs to understand the possible shots (e.g., deep, elevated, slightly cross-court shot with less pace) that can defuse the inevitable winner before play gets to that point. And if X2 does attempt to hit a winner, X1 also needs to know how best to return the ball (e.g., defensive lob) should it be reached. Positional tactics are of course specific to each sport. Just as the tennis players in the above example need to know how to both move their opponent around and recover when out of position, a wrestler needs to understand how to gain position and counter his opponent’s moves to do the same. Besides learning the skills associated with your sport(s), you must also learn its positional tactics.